From routine wellness care to orthopedic surgery, Perkins Veterinary Clinic is a full-service animal hospital that cares for all animals. Routine Wellness Care Is based in preventative health. 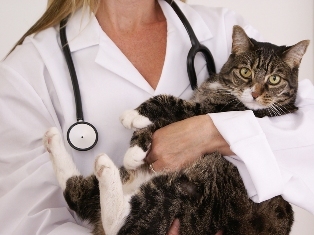 Examinations are an important opportunity to assess the health of your pet. Just like in humans, the earlier we can detect a health problem, the more quickly our veterinarian can recognize and treat the condition before it becomes serious. Vaccinations Regular vaccination protects your pet from serious diseases that can affect their health as well as yours. Routine Surgery Sterilization, help control the pet population, this surgery not only prevents unwanted pregnancy it also prevents some disfavorable behavior issues as well as decreases the chances of other more serious diseases. Sterilization is recommended between the age of 4 and 6 months, but can be done at anytime. Micro-chipping All veterinary clinics and shelters scan strays for microchips, Insure the return of your beloved pet, it is permanent identification. Urgent care Not everything is an immediate emergency, but may require propmt attention, our skilled team can ensure your pets immediate needs are addressed. Hoof Health We have a state of the art hydraulic shoot and can handle your your hoof care needs. This is a short list of what we offer, if it is veterinary chances are we do it. Feel free to call us if you have questions. Whether your animal is big or small, needs a wellness check up or emergency surgery, our animal clinic is proud to provide superior veterinary services. Visit us today, or request an appointment, and see the difference our care makes!